178 pages | 14 B/W Illus. China’s rapid economic development has not translated automatically into political development, with many of its institutions still in need of major reform. In the post-Mao era, despite the decentralization of local government with significant administrative and fiscal authority, China’s government and policy-making processes have retained much of the inefficiency and corruption characteristic of the earlier period. This book analyzes the implementation of government and policy-making reform in China, focusing in particular on the reform programmes instituted since the early 1990s. It considers all the important areas of reform, including the enhancement of policy-making capacity, reform of taxation and fund transfer policies, tightening of financial control, civil service reform and market deregulation. 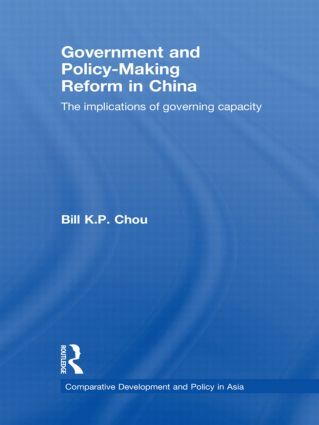 Bill K.P Chou assesses the course of policy reform in each of these areas, considers how successful reforms have been, and outlines what remains to be done. In particular, he explores the impact on the reform process of China’s entry into the WTO in 2001, demonstrating that the process of reform in China has been one of continuous conflict between the agenda of political elites in central government, and the priorities of local leaders, with local agents often distorting, delaying or ignoring the policies emanating from the central government. 1. Introduction. Concepts of Policymaking and Governing Capacity. Institutions and Administrative Behaviour. Structure of the Book. 2. Citizen Participation in the Policy Process. Citizen Participation: An Introduction. The CCP’s Concept of Citizen Participation. Institutional Context of Citizen Participation in Reform Era. New Forms of Citizen Participation. Conclusion. 3. Taxation Reform. Background of Taxation Reform. Tax Sharing Reform in 1994. The Aftermaths of Tax Sharing Reform. Coping Strategies to the Challenges of Tax Sharing. Concluding Discussion. 4. Reform of Spending Control. The Background of Reforming Public Spending Control. Reform Measures. Impact of Reforming Public Spending Control. Concluding Discussion. 5. Civil Service Reform. Introduction. Political Development and Civil Service Reform in China. Establishment of the Civil Service System. Staffing Reform. Reforming of Staff Development. Wage Reform. Conclusion. 6. Implementation of Administrative Licensing Law. Licensing Reform in China: A Background. Reform Strategies. Evaluation and Analysis. Conclusion. Bill Chou is Assistant Professor in the Department of Social Sciences at the University of Macau. His research interests include policy process, public sector and civil service reform, central-local relationships, local government, political economy, governance of China, and public sector reform in Macao.